What is the Shadow Party? The Shadow Party is a George Soros conglomerate. George Soros, a billionaire, has engineered campaign finance reform, by pouring tens of millions of dollars – and getting others to do it too – into the campaign finance reform movement. What this did was it limited the ability of the political parties to raise money. As soon as the campaign finance laws came into place, they had a loophole — and naturally they would, because Soros was behind this – for private organizations like MoveOn.org, called 527s, that could collect money. Soros managed to put together a coalition, which we call the Shadow Party, which accounted for about $300 million in the Democratic campaign. Actually, it was much more than that. He put together a group that orchestrated media ads, so that meant that his groups, since they were in place before the democratic nominee was even chosen, were able to shape the message of the John Kerry campaign and, in effect, control the campaign that way. But through another organization they have, Americans Coming Together, they also put together the ground war. ACT was composed of big government unions, like SEIU, and teacher unions. They were able to produce 100,000 campaign workers and huge amounts of money to knock on doors and get out the vote. 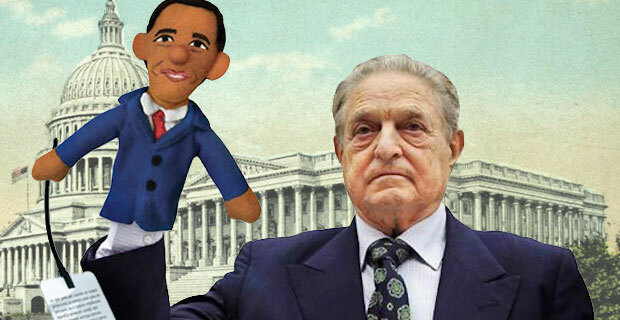 Because Soros and the group he put together control both the ground war and the air war of Democratic campaigns, that means that every elected Democratic official has got to pay attention to what they say. Barack Obama has two faces. After Trump’s victory and Hillary’s defeat, the public Obama has been gracious and diplomatic. His lectures to Trump, directly and indirectly, are couched in praise. He echoed the feeling of millions on both sides when he said, “We are now all rooting for his success”. President Obama is over. He knows that. There are still some things that he can do before he leaves office, but everything except the most destructive, can be undone by his successor. The next phase of his campaign will not be fought from the White House. It will be fought against the White House . The other Obama is emerging in conference calls with his supporters. “One of the challenges that I’ve discovered being president is I’d like to be organizer-in-chief, but it’s hard,” he said in one call. Obama can no longer be commander-in-chief. Instead he’s plotting to become organizer-in-chief. The infrastructure for the organization was put into place long before anyone thought that Hillary might lose. Organizing for Action gave him his own organizing hub. If Hillary had won, it would have been a pressure group. Now that Trump won, it’s an axis to build a personal counterrevolution around. In his post-election conference call with his OFA troops, Obama told them, “I’m giving you like a week and a half to get over it”. Then it would be time to “move forward not only to protect what we’ve accomplished, but also to see this as an opportunity”. What opportunity could there be in Trump’s win? Obama is now the only major national figure still standing among the Democrats. After Hillary’s defeat, he’s worked hard to attribute the loss to her shortcomings, not his policies and decisions. That’s not just to soothe his ego. If he’s going to dictate the future of his party, he can’t afford to be blamed for its latest disaster. And Obama is still determined to dictate the future of the party and the country. In conventional politics, Obama is done. There’s no way back into the White House. And Hillary’s fate won’t leave much enthusiasm for nominating the uncharismatic spouse of a charismatic ex-president. But Obama is not a conventional politician. He’s an organizer and a campaigner at the vanguard of a radical movement that seeks to control traditional institutions, but doesn’t feel bound by them. Unlike Bill Clinton, his plans don’t begin and end with the White House. As an organizer, Obama is equipped to build bases of power outside traditional institutions. And that is exactly what he is doing. The demoralization of the Democrats is, as Obama put it, an opportunity. Social chaos is a time for the left to overthrow and undermine traditional institutions. Fear, anger and despair are radicalizing. The left has always operated by throwing bombs and then profiting from the fallout. That’s Obama’s agenda. Having wrecked the country and the Democrats, he sees that not as a setback, but as an opportunity. While the leftist rioters in the streets are garnering the most attention, the real threat comes from the network of staffers dubbed Obama Anonymous which are beginning to organize and coordinate. OFA is Obama’s equivalent of the Clinton Foundation. The Clintons built Clintonworld around staffers, but its goal was harvesting money. Obama Inc. is being built around organizing and activism. Like Clintonworld, it will be a network encompassing a variety of political and non-profit institutions. Unlike them, it will be much less focused on directing money to its bosses in preparation for an election. Instead it will function like a traditional leftist movement, merging influence operations with crowdsourced mobilization. OFA will be far more dangerous in the wild than the Clinton Foundation ever was. The Clintons hoped to ride back to power on a giant wave of money. Obama is taking a much more radical course. The staffers exiting government are being wired into Obama Inc. whether or not they take jobs directly working for him. The OFA alumni are building networks across organizations while taking their marching orders from him. They expect Obama to lead them back from the wilderness and into the halls of power. “I’m going to be constrained in what I do with all of you until I am again a private citizen. But that’s not so far off,” he assured them. “I’m still fired up and I’m still ready to go.” His next comments promised that radical political change could and would take place. Obama isn’t going to retire. He’s not going to spend years puttering around with a presidential library. He’s not even going to set up a Clintonesque slush fund and try to make his wife president. Instead he wants to force radical change from outside the White House by using the network he’s built. While the public Obama wraps up business at the White House, concludes yet another world tour, alternating between praising Trump and offering him condescending advice, the other Obama is preparing to deploy a network that will dominate the Dems and set the agenda on the left. If Obama succeeds, then he will get another shot at picking his White House successor. But beyond that, he’s been handed the keys to an organizing machine that will allow him to set even more of the agenda for his party than ever before. And he has a cause that is sending the party reeling back into his arms. Obama believes that he can rule America from outside the White House. And he might be right. Political norms and old rules have been falling faster than leaves in an autumn wind. If Obama sets out to move the center of power outside the White House and into an organization that will control national politics through the left, it would be dangerous to assume that he can’t and won’t succeed. The Democrats didn’t respond to their defeat, one of a sequence, by trying to move to the center. Instead there is every sign that they are moving further to the left. Keith Ellison, a radical leftist with an anti-Semitic past, is tipped to head the DNC. Schumer still has the Senate, but Elizabeth Warren may have it before too long. Combine that with Obama as the president-in-exile and the Dems will be more radical and extremist than they were even when Obama was sitting in the White House. Obama sees Hillary’s defeat as an opportunity to burn the Dem’s last bridges with the larger country and its “bitter clingers”, to double down on nationalizing power and to define the political narrative around the agendas of urban elites. The left crippled the Democrats. Now it wants to utterly consume them. The election was a catastrophic disaster for the Democrats, but it opened all sorts of doors for Obama. Hillary’s defeat removes the Clintons, his only real internal rivals, off the stage. Trump’s triumph in working class areas cuts more ties with the traditional Dem base and transforms it into a party of left-wing urban elites and their radical agendas. And the popular figures on the left, Bernie Sanders, Elizabeth Warren, Keith Ellison, lack his national stature, speaking skills and organization. Obama will move to consolidate the left. And then the Democrats. He will function as a president-in-exile heading up the opposition to Trump. When it comes to verbally challenging Trump, Obama will be more likely to be interviewed and heard than Ellison or Schumer. And his people will coordinate responses across the left from street level organizing to think tanks and policy moves. Some of it is ego. Obama believes that he can find the key to beating Trump in the traditional tactics of the left. But most is ideology and power. Obama is not done transforming America. And America isn’t done with him yet.